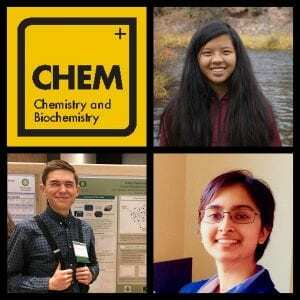 Meet our 2018 Chemistry and Biochemistry Scholarship Recipients! Last June, Alexi Overland, Dylan Bardgett and Rima Pandit were selected as the recipients of the 2018 UO Chemistry and Biochemistry department undergraduate scholarships. Alexi Overland was awarded the Faith Van Nice Scholarship, which is dedicated to the memory of alumna Faith Van Nice and recognizes exceptional UO undergraduate students majoring in Chemistry or Biochemistry. Alexi is a sophomore majoring in Chemistry and Environmental Science. 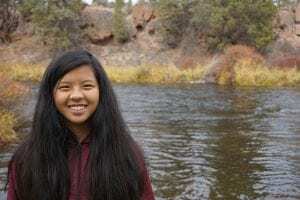 Growing up in Bend, Oregon, Alexi recalls becoming hooked on science and math at a very young age. Together with a passion for the outdoors, this led to an interest in climate change, sustainability, and protecting environment. While in high school, Alexi came to the UO campus during the summer to participate in enrichment programs, including one that incorporated chemistry. Green chemistry in particular sparked her interest, and influenced her choice of the UO for her undergraduate studies. In her freshman year, Alexi joined the David Tyler lab, researching the mechanisms that influence chemical reaction rates. Their work seeks to create more efficient reactions in order to increase the effectiveness and sustainability of materials. Alexi is very grateful to the Van Nice’s for supporting the educational achievements and career aspirations of undergraduate students. For now, she is keeping her career options open. After earning her bachelor’s degree, she is considering the polymer track offered through the UO Masters Industrial Internship Program, and perhaps pursuing a PhD after a few years of working in industry. The Kuntz-Swinehart Memorial Scholarship was given to Dylan Bardgett. This award, which recognizes academic excellence in our majors, was established by former UO Chemistry students in honor of two professors whose instruction, influence and inspiration had a significant impact on their career paths. Dylan grew up in Eugene, Oregon, but didn’t particularly plan on attending the University of Oregon. He looked at several institutions, both public and private, including Oregon State. 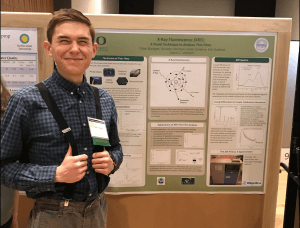 But it was his UO visit as a prospective student – where he first heard about green chemistry – that changed his trajectory from a Beaver to a Duck. Now a junior at the UO, Dylan is majoring in Chemistry with minors in Physics and Math. Dylan is interested in developing more cost effective and energy efficient forms of alternative energy. As an undergrad researcher in the Dave Johnson lab, his research looks at ways to quantify the composition of thin films by measuring the atomic density of thin film layers in semi-conducting materials, and investigating how density relates to efficiency in applications such as solar panels and optics. He is second author on a paper published in Chemistry of Materials. This was the second year that Dylan applied for Kuntz-Swinehart Scholarship, and says he felt surprised, honored and humbled to be selected for the award. After graduation, he plans to pursue his PhD and do post-doctoral research at university or in the private sector. Dylan has also enjoyed teaching as one of the department’s SuperChem Peer Learning Assistants, and the idea of eventually begin able to combine teaching and research in academia is very appealing. 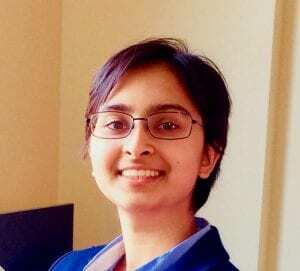 Rima Pandit, a sophomore Human Physiology major from Portland, Oregon, was selected as the recipient of the department’s inaugural P-Chem Undergraduate Fellowship. The fellowship provides funding for students to conduct research during the summer in a physical chemistry lab at the University of Oregon, under the mentorship of a physical chemistry faculty member. Rima’s summer research in the Cathy Wong lab involved characterizing the photo-physical properties of semiconducting organic molecules using laser techniques, in order to design and develop energy-efficient LEDs and photovoltaics. Rima finds that the study of chemical processes and instrumental technologies dovetail nicely with her pharmaceutical and pre-medicine objectives, because scientific discoveries are so often integral to medical advances that aid people in their recovery and well-being. She culminated her summer research experience by presenting their findings to fellow research physicists and chemists at the Optical, Molecular & Quantum Science (OMQ) Fall 2018 Symposium, where she was recognized with the ‘Best Poster Award’. Rima is grateful for the recognition afforded her by the fellowship, and the opportunity to acquire new skills and work with a talented group of team members. After graduating, she plans to go to medical school with the goal of providing healthcare for underprivileged women, seniors, and veterans using a holistic well-being approach. Rima hopes to work with Doctors Without Borders, and serve in the US Army. Scholarships & Fellowships » Meet our 2018 Chemistry and Biochemistry Scholarship Recipients!